Sian Griffiths meets 10-year-old Charlie Lowthian-Rickert. Charlie is a transgender activist. Charlie Lowthian-Rickert stands in an open red car. She is wet from the rain. 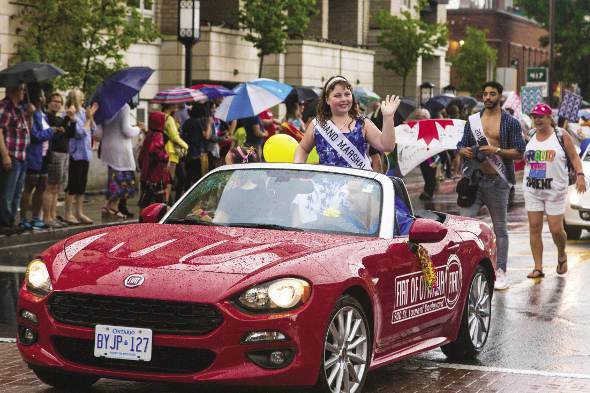 And she leads the 2016 Ottawa Pride Parade. She waves to the crowds. They shout ‘We love you, Charlie!’. She wears a blue dress and she looks very much a young girl. She sees herself as a girl but Charlie was born a boy. And at the age of 10 she is already a transgender activist. Tammy Dopson is the Director of Ottawa Pride. She says Charlie was the best person to lead the parade. She is the youngest person to lead the parade. The leader of the parade is for someone who helps people through education and helps them to make their lives better and fuller. Charlie has become well-known very quickly. Two years ago when she was only eight, she went with her parents to a meeting in the Canadian Senate. The meeting was about new laws to protect transgender people from discrimination and hate crimes. But, as in the US, toilets became a political problem. The Conservative Party wanted transgender people to use the toilets for the gender when they were born. Charlie was very angry, but she was sitting with representatives from Amnesty International, Gender Mosaic, and other LGBTQ groups. And this gave her the idea to join them. She helped with a protest on Parliament Hill called ‘Occupotty’. They sang ‘Let Us Pee’. She stood in front of rows of toilet seats and told the crowd why the toilet problem is important to transgender people. There was a lot of national interest in the protest. She hopes new laws will make transgender people feel safer. In May 2016 Jody Wilson-Raybould was the new Liberal Justice Minister. With Charlie by her side she introduced transgender rights laws again. The Minister says Charlie is very wise for her age. Charlie says Wilson-Raybould is ‘one of my best friends in Parliament’. But Charlie knows she can only do this work with the help of her family. ‘We didn’t want to be our child’s first bullies,’ says her mother, Anne. Charlie felt bullied at her primary school and in her rural community. So the family moved to Ottawa. There they found a school which accepted Charlie and she did really well there. Her mother is now busy taking Charlie from Girl Guides to hip-hop dance to skateboarding and to camping. In Ottawa half of all homeless young people are LGBTQ. And they live on the streets because their families do not accept them. Charlie understands these terrible statistics very well. Sian Griffiths is a radio and online journalist in Ottawa. She works for the German National broadcaster, Deutsche Welle, the BBC, and for publications like The Guardian and The Christian Science Monitor. This page was last edited on 27 November 2016, at 17:40.